I always struggle so hard getting up on Monday mornings and even more, when my Sunday turns out to be a day in bed or on the sofa doing nothing but watching TV and drinking lots of tea. But recently, I feel like all my days look pretty much the same as it's getting really cold here and I just can't be bothered doing much! I've gotten so lazy ever since my studies are about to finish, ugh! This look was totally out of my comfort zone at the beginning as I usually don't really wear bright colors and even less around fall / winter time. But I felt like I needed to change it up a little and stop wearing the same black pair of jeans or my black leather jacket (even though it's so hard man, it's HARD!). I bought this white/pink blouse a while ago from ZARA and loved it right away. 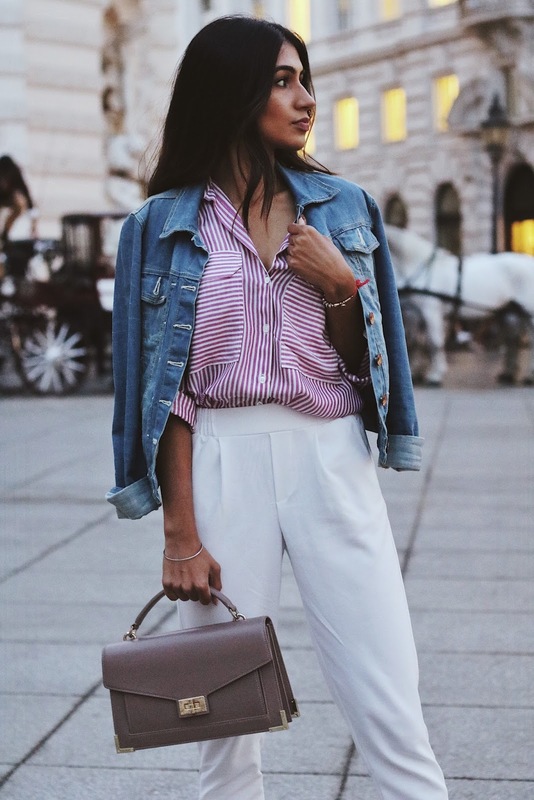 I have the same with blue stripes as well and it's definitely one of those pieces you have in your wardrobe and feel like you can wear anywhere. The blouse I paired with a white pair of loose fit trousers which I've had in my closet for months now but only got to wear once until now (props to me, I managed to keep it stain free, whoop!). 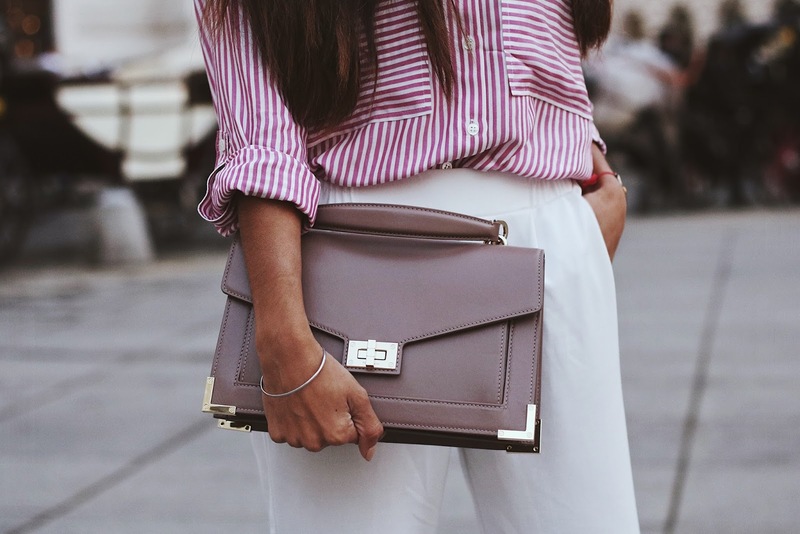 The taupe colored bag is a new addition to my wardrobe and is from a brand called The Kooples and was designed in collaboration with the amazing Emily Ratajkowski. Funny thing, I won it through an Instagram giveaway hosted by the lovely tatjanamariposa, which I never thought I would actually win, haha! // Happy Monday meine Lieben! Dieses Outfit lag anfangs total außerhalb meiner Komfortzone, da ich sehr selten so eine helle Farbkombi trage und noch weniger während der Herbst / Winter Zeit. Aber ich dachte, ich sollte meinen Look mal etwas auffrischen und mich schweren Herzens von meiner schwarzen Jeans und der schwarzen Lederjacke trennen (so hart das auch ist...). Die pink/weiße Bluse habe ich vor kurzem bei ZARA ergattert und sofort geliebt! Ich besitze bereits dieselbe mit blauen Streifen und finde sie ist eines dieser Kleidungsstücke, die man irgendwie immer wieder mal tragen kann. Zu der Bluse habe ich eine lockere weiße Hose kombiniert, die ich schon eine ganze Weile in meinem Schrank hatte, aber bis jetzt nie wirklich getragen habe. Die Tasche ist ein Neuzugang in meinem Schrank und habe ich lustigerweise durch ein Instagram - Gewinnspiel der lieben tatjanamariposa gewonnen. Die Marke heißt The Kooples und die Tasche wurde in Kollaboration mit der tollen Emily Ratajkowski entworfen und sieht einfach in jeder Farbkombination super schön aus! Nice post as always! And the outfit is just perfect, love it !